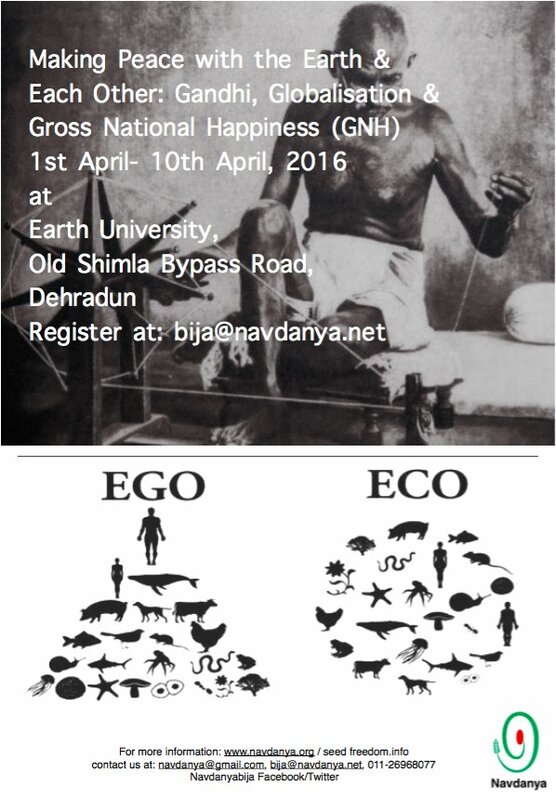 Navdanya, 1 April 2016 — Over 40 participants from five continents have come to the Biodiversity conservatory farm at Ramgarh to attend the 15th Gandhi and Globalisation course. This is course is designed to make participants learn the principle of harmony with nature, by adopting non-violent and other Gandhian methods. Navdanya’s ‘Making Peace with the Earth and Each other: Gandhi and Globalisation’ is being taught by eminent Gandhians and environmentalist from around the world. The faculty include Dr Vandana Shiva, executive director of Navdanya, Satish Kumar, an Indian activist and editor of the Resurgence & Ecologist magazine, Pv Rajagopal, is from the gandhi family and in 1993 became the Secretary of Gandhi Peace Foundation. Along with them are Jill Carr-Harris who has been a leader in the Ekta Parishad’s women wing for over a decade and Dr Madhu Suri Prakash, who is a recipient of the Eisenhower Award for the distinguished Teaching and is professor of Education at the Pennsylvania State university. Dr Shiva addressing the participants said, “ The Gandhian philosophy of Swadeshi and Swaraj are the driving force behind Navdanya. The course is way to spread Gandhi’s message of peace,harmony and equality. We are Navdanya have conserved biodiversity, and promoted non-violent agriculture to be in harmony with nature and our fellow beings”. Since March 2016, Navdanya has also entered its 30th Anniversary year, and to make the course more memorable Navdanya has invited a team from Bhutan. This will have members from the GNH centre that will be talking to participants about the Gross National Happiness module and assessment tool. Bhutan is the first country to adopt this model, rising above the paradigm of Gross Domestic Produce (GDP). The team will have Dr Saamu Chetri and Drona Chettri. The ten day course will have discussion on Gandhian thought, environment and other social issues that concern our country and the world today. 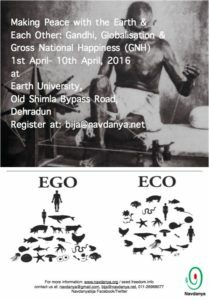 No Comments to "Gandhi and Globalisation course gets people from all over the world to Dehradun"